With Bryan traveling to D.C. to surprise his family at his new niece’s christening, I had the weekend to catch up on a few things and spend time with the girls, both much needed. But first to finish the week strong (and with great fall weather) I did my last FareStart for a while with the Guest Chef being Stopsky’s Delicatessan from Mercer Island with a great menu and our monthly staff meeting on Friday (which was nice because I missed the last one). 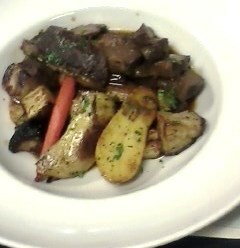 Braised Short Ribs, Mushroom Demi, Glazed Root Vegetables, Fried Leeks. 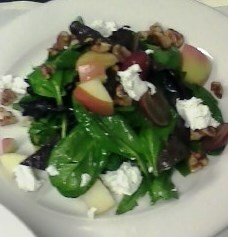 Pretty than the picture suggests. Friday night and Saturday morning were restful and refreshing with home cooked meals, Michigan football, and short runs with the little dog we were dogsitting. Saturday night I headed over to Philipp’s apartment with Polly for his Oktoberfest and all things German. He made German pork roast, spatzle, and German potato salad and friends all brought Oktoberfest beers…I love pumpkin beers…and Elysian Brewery in Seattle makes several great ones!!! We had girl’s night plans of watching crazy Miley Cyrus on SNL. Better than expected but still that girl is crazy! Sunday morning was Seahawks time!!! Hashtag not winning!! It was a sad loss but at least it was a beautiful day. I experimented with another soup; zucchini soup. 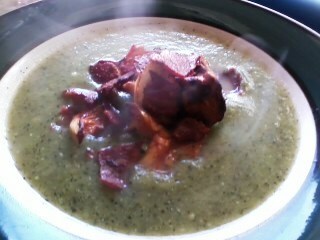 Creamy zucchini soup (no cream) topped with turkey bacon and sauteed chanterelles. I rode my scooter to West Seattle to help a friend paint his ceiling. Afterwards I ran some errands downtown, pick up birthday freebies and had a dinner on my own at Palomino’s. It was super delicious, filling and pretty much free thanks to my birthday club deal. 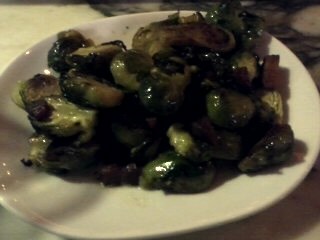 DELICIOUS brussel sprouts made so healthy with crispy fried pancetta and vanilla butter. Large portion!! 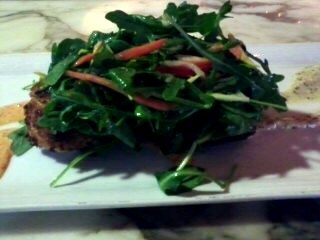 Amazing crab cakes underneath an arugula salad with creamy mustard and spicy aioli. Bryan’s back!! !…and so is the fall weather…and work.